A pigeon house or Dovecote was a symbol of immense power and status in many European countries. These towers, where pigeons flock and grow, are built for the meat and droppings of pigeons. The Egyptians have a taste for these pigeon houses. The Egyptian city of Mit Gahmr, though is the largest producer of aluminium in that country, looks more like a medieval fortress if you look at any of the images of the city. The skyline is dotted completely by pigeon houses. Back here in Qatar, all the mosques offer food for the pigeons at least twice a day, but purpose-built pigeon houses are rare to find. That distinction was rectified when Katara or the ‘Cultural Village’ opened a year ago. 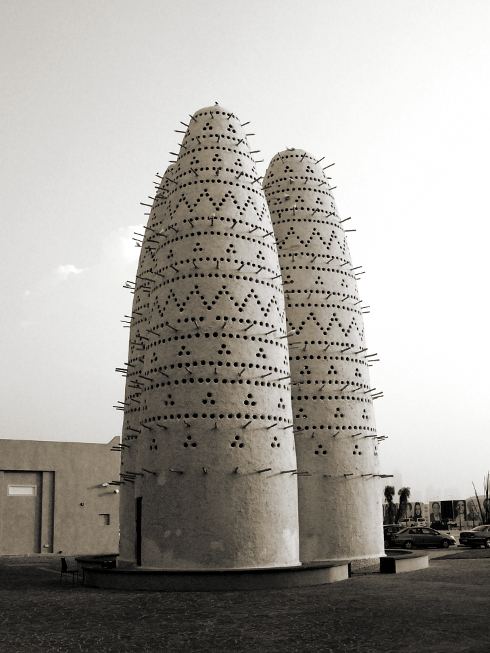 The mosque in Katara is host to a spanking new three-tower Dovecote that is strikingly different in architecture to the surrounding buldings. It is covered entirely in mud. Its towering presence is masked only by the tower of the mosque. And did I say all the pigeons housed here are white in color? On a cool evening, they appear in stark contrast to the bright orange of the towers. Another reason to pay a visit to Katara is the presence of some of the best restaurants in the city, particularly Khan Farouk. Surprise! it is an Egyptian restaurant.